Today's 70% Cacao Mint Crisp Bar was from The Oakland Chocolate Company (Oakland, CA). Chief chocolate maker, Nancy Nadel, makes bean-to-bar chocolates from scratch with cacao beans from Jamaica. The company's chocolates can be ordered online, or purchased at some local haunts and farmers markets. Summer is great fun, but not always for chocolate vendors. It's a challenge to sell or transport chocolate outdoors in hot summer weather. 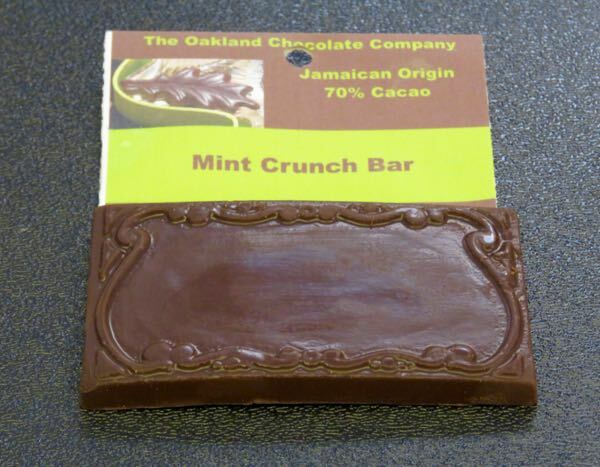 But, Nancy Nadel at The Oakland Chocolate Company manages. She sells her chocolates on Fridays at the Old Oakland Farmers' Market in downtown Oakland, and was keeping her bars and confections in a cooler in the shade yesterday. I scurried back to an air-conditioned car with her chocolates after buying them as fast as possible. The Mint Crunch Bar was a thick creamy bar with a slow melt, filled with earthy dark cacao bean flavor. 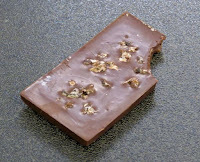 A light sprinkling of candied cacao nibs (pieces of bean) supplied extra cacao flavor and crunchy texture. And peppermint oil provided a subtle hint of mint. Last, but not least, this bar wasn't overly sweet (a plus).